Zoo With Roy staff reporter ZWR was able to sit down (Editor's Note: BEFORE last night's game ... you'll see) with one of the Phillies' recently acquired pitching prospects and ask a few questions that will help fans to become better-acquainted with the newest Fightin'. Nate Schierholtz: Thanks a bunch, Rick. ZWR: So introduce yourself to Donkey Nation- How has life in the minors treated you? Without getting ahead of ourselves, when do you expect to make the bigs? Nate Schierholtz: Dude, I’ve been in the majors for like five years. ZWR: Wait what? You’re not a quote unquote top prospect? Nate Schierholtz: No. I’m a real player. ZWR: So, um, Nate-- what's your best pitch? ZWR: Oh! Right. You're that guy that used to be on the Pirates and Braves. Nate! Nate Schierholtz: No, no. That was Nate McClouth. 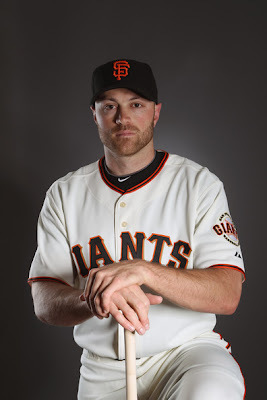 My last name is Schierholtz, I've been with the Giants since 2007. ZWR: Really? Weird, don't remember that. Did you play against us in the 2010 NLCS? Nate Schierholtz: Yes, I did. Nate Schierholtz: Well, actually, I was 0-3 with three strikeouts... [self-deprecating chuckle]. ZWR: So, wait, why’d you only bat three times? Nate Schierholtz: I- I don’t make those decisions. ZWR: I know, but that team … man, its offense STUNK. Nate Schierholtz: We beat you, didn’t we? ZWR: You mean “us”, chump. Nate Schierholtz: Whatever. Let’s get back to the interview. ZWR: I mean, I don’t even … I still wish you luck and all. I’m just kind of surprised. ZWR: Yeah look, anyway. Uh, how did you react when you found out you had been traded to the best team in the universe? Nate Schierholtz: Oh. Um, well, I was pretty surprised. I had backed off my repeated requests to be traded in recent months so I thought that we had come to an understanding and that I would be sticking around with the Giants. ZWR: Wait-- you were making trade demands?! Nate Schierholtz: [stares blankly at ZWR] What? ZWR: -AHAHAHAHAHAHAHAHAHAHAHAAHAAAAAAAA. Oh man, hoo boy. That's rich. Nate Schierholtz: Why? It happens all the time. ZWR: Um, actually, it really doesn't. And usually the guys who do that sort of thing, you know... they, uh, well... how should I put this? Okay I'm just going to say it-- they're usually really good players! Nate Schierholtz: Are we almost done? ZWR: No but seriously, what's your out pitch? Next time I'm at a game and need to heckle a position player I'm going to should "What's your out pitch?"